Lewis Hamilton stamped his authority on the Macau Grand Prix field during a Safety Car interrupted qualification race on Saturday after grabbing the lead on the opening lap and remaining unchallenged throughout the 10-lap encounter. The Briton eventually finished 2.2 seconds ahead of Nico Rosberg, with Alexandre Premat third. Hamilton got away well from his second place on the grid and instantly tucked into the slipstream of pole position man and Manor Motorsport team-mate Robert Kubica. He managed to draft past on the outside as the pair approached Mandarin Bend and, as Kubica lifted, Hamilton swept into the lead, which he held onto through Lisboa Bend. "It was very scary," said Hamilton of the decisive move. "Robert was covering the inside as I got the tow. I pulled up to the left side and was passing him but not enough to get past him and we could not go through side-by-side. So I hoped to make him scared and lift, and he did that - although I went through sideways." Kubica's hopes of making an instant response were dashed when the Safety Car was called out following a series of incidents on the grid. 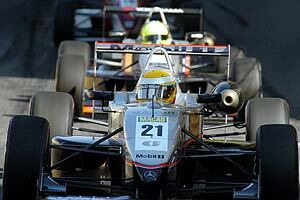 Richard Antinucci had got away slowly from third place on the grid and was clouted from behind by Nelson Piquet Jr., while further back there was a much bigger accident as Eric Salignon slammed into the back of the stalled Kazuki Nakajimi before spearing off into the barrier. Also involved in the incident were Marchy Lee, Ho Pin Tung and Rodolfo Avila. The Safety Car remained out until the start of lap five, as Salignon needed assistance to get out of the car, but as soon as the race restarted Hamilton made a brilliant getaway to pull clear of the field. Behind him, Kubica came under instant pressure from Rosberg and lost second place on the run into Mandarin. With Hamilton looking unstoppable at the front, Rosberg was happy to settle for the second slot that will ensure him a front-row start position for Sunday's 15-lap race, while behind him Premat took third after diving past Kubica into Lisboa on lap six. Kubica duly finished fourth, with fifth-placed finisher Jamie Green's bid to wrest that spot from the Polish driver in the closing stages failing to come off. Behind Green, last year's pole position man Fabio Carbone finished sixth, ahead of Loic Duval, Lucas di Grassi, James Rossiter and Danny Watts.